USDA loans are mortgages backed the U.S. Department of Agriculture as part of its USDA Rural Development Guaranteed Housing Loan program. USDA loans are available to home buyers with low-to-average income for their area, offer 100% financing with reduced mortgage insurance premiums, and feature below-market mortgage rates. USDA home loans are putting people in homes who never thought they could do anything but rent. This USDA loan information is accurate as of today, April 24, 2019. What is a Rural Development loan? For eligible suburban and rural home buyers, it’s a 100%, no-money-down mortgage loan backed by the U.S. Department of Agriculture (USDA). The Rural Development loan’s full name is the USDA Rural Development Guaranteed Housing Loan. However, the program is more commonly known as a USDA loan. The Rural Development loans is also sometimes called a “Section 502” loan, which is refering to section 502(h) of the Housing Act of 1949, which makes the program possible. The good news is that the USDA loan is widely-available. 97 percent of the geographic United States is in USDA loan-eligible territory. Yet, if you’re like most U.S. consumers, it’s a program you’ve only just learned about. This is because the USDA loan program wasn’t launched until the 1990s. Only recently has been updated and adjusted to appeal to rural and suburban buyers nationwide. Most lenders don’t even list the USDA loan on their menu. Using a USDA loan, buyers can finance 100% of a home’s purchase price while getting access to better-than-average mortgage rates. This is because USDA mortgage rates are discounted as compared to rates with other low-downpayment loans. The repayment schedule doesn’t feature a “balloon” or anything non-standard; the closing costs are ordinary; and, prepayment penalties never apply. The two areas where USDA loans are different is with respect to loan type and downpayment amount. With a USDA loan, you don’t have to make a downpayment; and you’re required to take a fixed rate loan. ARMs aren’t available via the USDA rural loan program. Rural loans can be used by first-time buyers and repeat home buyers alike. Homeowner counseling is not required to use the USDA program. The Rural Housing Loan program is a product of the U.S. Department of Agriculture. The program is partially self-funded. Similar to the Federal Housing Administration’s FHA mortgage, the USDA uses homeowner-paid mortgage insurance premiums to keep the USDA home loan program going. As of October 1, 2016, USDA has lowered its mortgage insurance costs for both the upfront and monthly fees. As a real-life example: A homebuyer with a $100,000 loan size in Blacksburg, Virginia, would be required to make a $1,000 upfront mortgage insurance premium payment at closing, plus a monthly $29.17 payment for mortgage insurance. USDA mortgage insurance rates are lower than those for comparable FHA loans or conventional ones. With USDA loans, then, mortgage insurance premiums are just a fraction of what you’d typically pay. Even better, USDA mortgage rates are low. 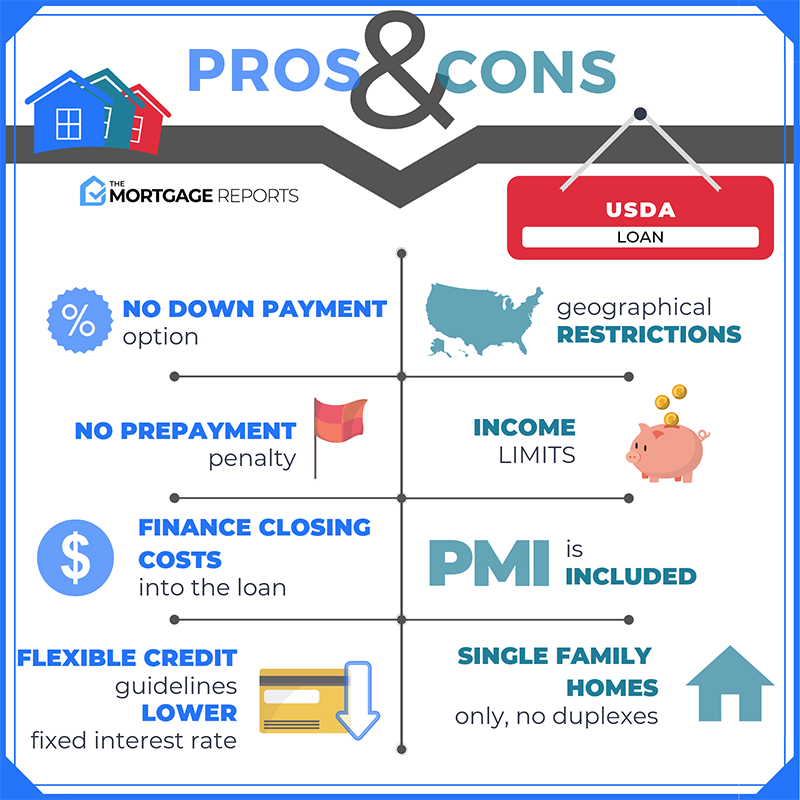 USDA mortgage rates are often the lowest among FHA mortgage rates, VA mortgage rates, and conventional loan mortgage rates — especially when buyers are making a small or minimum downpayment. For a buyer with average credit scores, USDA mortgage rates can be 100 basis points (1.00%) or more below the rates of a comparable conventional loan. Lower rates mean lower payments, which is why USDA loans can be extremely affordable. As a home buyer, you can control a lot of things. You can control where you buy, what you buy, when you buy, and how much you spend a home. However, you can’t control your mortgage rates. Mortgage rates are “born” on Wall Street; based on the price of a special type of bond called a mortgage-backed security (MBS). Then, after the price of a mortgage bond is set, your mortgage lender acts as a middleman between you and the MBS market, setting the final rate you get in your quote. This is why it’s always smart to comparison shop lenders — each bank will play its middleman role differently. Lenders with small markups will show lower rates. Lenders with big markups will show higher rates. However, as compared to other loan programs, USDA mortgage rates are often the lowest available. This is because, unlike FHA mortgages and conventional loans, USDA loans are guaranteed by a government agency — in this instance, by the U.S. Department of Agriculture. Because of the USDA guaranty, lenders making USDA loans today are protected against loss in a way that loans via the FHA or any other agency cannot provide. With lower risk comes lower rates. Only VA loans, which are backed by the Department of Veterans Affairs, offer a similar guaranty (and similarly low mortgage rates). Are USDA mortgage rates good? USDA loan rates are often lower than comparable conventional 30-year fixed mortgage rates. Plus, because mortgage insurance rates are lower, with your small down payment, USDA loans can often be a better deal as compared to FHA loans or conventional loans. When mortgage rates fall, can I refinance my USDA mortgage? Yes, USDA loans are eligible for refinance. The USDA Streamline Refinance Program waives income and credit verification so closings can happen quickly. Home appraisals aren’t required, either. The USDA loan guidelines are straight-forward. However, note that you must qualify for the program and your home must be qualified, too. Here are some common USDA mortgage questions. Why does the USDA offer the Rural Development loan? The USDA Rural Development loan is meant to help households of modest means get access to housing and mortgage loans in some of the less densely populated parts of the country. By enabling homeownership, the USDA helps to create stable communities for households of all sizes. How do I check if my home eligible for a USDA loan? With the USDA Rural Housing Program, your home must be located in a rural area. However, the USDA’s definition of “rural” is liberal. Many small towns meet the “rural” requirements of the agency, as do suburbs and exurbs of most major U.S. cities. 97% of the United States is USDA loan-eligible. Only 3% is ineligible. How can I find if my area is USDA-eligible? The website of the U.S. Department of Agriculture lists eligible USDA communities by census tract. You are required to provide a home’s exact address. The website will show whether that home meets program guidelines. What is the USDA program’s minimum downpayment? The USDA has no down payment requirement. You can finance 100% with a USDA loan. Is there mortgage insurance (MI) on a USDA loan? USDA loans require mortgage insurance (MI) to be paid. As of April 24, 2019, USDA mortgage insurance premiums include a 1.00 percent upfront fee, which is added to your loan balance at closing; and, an annual fee of 0.35%, which is added to your payment monthly. What’s the maximum USDA mortgage loan size? There is no maximum loan size for the USDA loan program. The amount you can borrow is limited by your household’s debt-to-income. The USDA typically limits debt-to-income ratios to 41%, except when the borrower has a credit score over 660, stable employment, or can show a demonstrated ability to save. Is the USDA loan program limited to first-time buyers? No, the USDA Rural Housing Program can be used by first-time buyers and repeat buyers. Can I finance the Upfront Mortgage Insurance into my mortgage? Yes, the USDA will let you finance your Upfront Mortgage Insurance payment into your loan size. For example, if you bought a home for $100,000 and borrowed the full $100,000 from your lender, your Upfront Mortgage Insurance would be $1,000. You could then raise your loan size to $101,000. Where can I find a USDA loan lender? The U.S. Department of Agriculture website maintains a list of lenders in the Rural Housing Program. Visit its website to search for a lender, or just skip to the rate quote. The Rural Housing loan is available as a 30-year fixed rate mortgage or a 15-year fixed-rate mortgage only. There is no adjustable-rate mortgage (ARM) program available via the USDA. Closing costs vary by lender and location. For example, some lenders have high origination charges. Others do not. The same is true for state and local governments. Costs are high in some states and low in others. Because closing costs vary, be sure shop around to find the most suitable combination of low mortgage rates and low costs. I can’t afford closing costs. Can I get a gift for my closing costs? Yes, USDA loans allow gifts from family members and non-family members. I negotiated to have the seller pay my closing costs. Is that allowed? Yes, the USDA Rural Housing Program allows sellers to pay closing costs for buyers. This is known as “Seller Concessions“. Seller concessions may include all or part of a purchase’s state and local government fees, lender costs, title charges, and any number of home and pest inspections. Can I use the USDA loan for a vacation home? The USDA loan cannot be used for a vacation home, it is for primary residences only. Can I use the USDA loan for an investment property? Is there a minimum credit score for the USDA loan program? On December 1, 2014, USDA implemented a minimum score of 640. Before that date, USDA set no minimum score for the program. However, most lenders did. When USDA implemented an official credit score minimum, it did not exclude very many additional buyers. If you are without a credit score, your lender may accept “alternate” tradelines to establish a credit history. I recently went back to work. How long until I am USDA-eligible? If you are a W-2 employee, you are eligible for USDA financing immediately; you don’t need a job history. If you have less than 2 years in a job, however, you may not be able to use your bonus income for qualification purposes. I am self-employed. Can I use the USDA loan program? Yes, self-employed persons can use the USDA Rural Housing Program. If you are self-employed and want to use USDA financing, as with FHA and conventional financing, you will be asked to provide 2 years of federal tax returns to verify your self-employment income. Can I do a “cash out” refinance with the USDA program? No, the USDA Rural Housing Program is for purchases and rate-and-term refinances only. Can I use the USDA loan program for my working farm? No, the Rural Housing Program is for residential property. Can I use the USDA loan program for a new construction home? Yes, the USDA loan program can be used for newly-built homes and other new construction. Can I use the USDA loan program to make repairs and improvements to an existing home? Yes, the USDA loan program can be used to make eligible repairs and improvements to a home. This may include replacing windows or appliances; preparing a site with trees, walks, and driveways; drawing fixed broadband service to the home; and, connecting water, sewer, electricity, and gas. Can I use the USDA loan program to make a home accessible to persons with physical handicaps? Yes, the USDA loan program can be used to permanently install equipment to assist household members with physical disabilities. Do I have to escrow my taxes and insurance with a USDA mortgage? Yes, USDA mortgages require borrowers to escrow taxes and hazard insurance with a lender. You may not pay your real estate taxes or annual homeowners insurance separately. Can I use the USDA loan program to make energy-efficiency improvements to a home? Yes, the USDA loan program can be used to purchase and install materials meant to improve a home’s energy efficiency, including windows, roofing, and solar panels. This list is not meant to be comprehensive of what the U.S. Department of Agriculture allows with a home loan, but it covers a lot of good ground. For more information, talk to your lender, or start with a mortgage rate quote online.